AFP South Sound (AFPSS) offers its interested members the opportunity to learn and grow through a chapter-based mentorship program. The mentoring program matches knowledgeable, well-rounded mentors with individuals who are relatively new to development or are interested in learning more about a particular area in fundraising. One-on-one matches provide opportunities for focused discussions, problem solving and sharing the trials and tribulations of working in this dynamic (yet sometimes challenging) industry. These relationships are meant to be career specific and not used or construed in any way as a consulting relationship. Mentors are encouraged to recommend appropriate resources (i.e., courses, workshops, educational opportunities, vendors and/or consultants). The mentoring program is not a job placement service. Mentor Application: Application dates and links to come. Mentee Application: Application dates and links and mentor bios to come. If you are not already on the AFP mailing list, sign up to be reminded about deadlines for the current round and to find out when future rounds go live. A minimum of one year of development experience (volunteer fundraising counts). An interest in learning from an experienced fundraising professional. A commitment to working with your Mentor for one year. Minimum of four face-to-face meetings, in addition to phone calls and emails. Joint attendance in one or more AFPSS or other fundraising continuing education course (in-person, webinars, conferences, etc.). Joint attendance at a local service club, chamber or networking event. A minimum of five years of experience in various areas of fundraising. Adherence to the AFP Ethical Principals and Standards. A desire to share development knowledge and build mentoring skills. A commitment to working with your Mentee for one year. 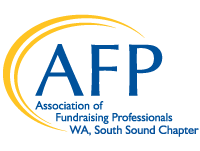 Joint attendance in one or more AFPSS or other fundraising continuing education course. Mentor/Mentee pairs will be assigned by the membership committee based on the Mentees’ needs and Mentors’ experience. We will make every effort to pair Mentees with one of their choices submitted in the application. Mentors and Mentees must be current AFPSS members, and Mentees must be in an active development role. Workplace locations are taken into consideration when matches are assigned so that every effort can be made for the pairs to meet face-to-face. The pairs will be monitored by the committee, with check-ins at least quarterly, and modifications will be made as needed. An end of year, a survey will be conducted to assess success/effectiveness of the program. For questions about the AFPSS mentorship program, contact Jennifer Wolbrecht, Membership Committee Chair, at Jwolbrecht@pierce.ctc.edu.